The Status feature of your Linksys Smart Wi-Fi Account shows useful information about the connected devices in the network. There are two (2) ways to check the network status. 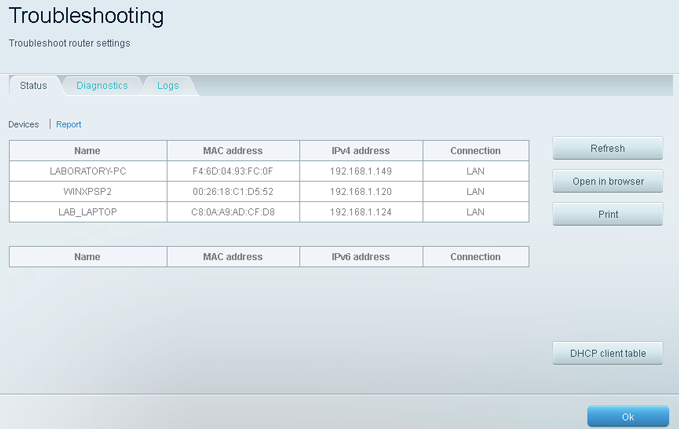 You can either access Devices which displays the details about the devices currently connected to the router or through Report for a complete summary of your router and its current network settings. Why is checking the network status important? It is important to check the network status of the devices that are connected to your router if you want to know the network's settings. This information can be helpful when you call Internet Service Provider (ISP) or LinksysTechnical Support for help with your router's Internet connection. The Status tab will then open and the list of the devices currently connected to the router will be displayed. To check the complete summary of the router and current network settings, click Report. QUICK TIP: The Refresh button re-displays the most current information and the Open in browser button displays the information in a web browser window. The Print button allows you to print the information that is currently displayed in the Troubleshooting window, while the DHCP client table button allows you to view the current DHCP client list. To learn how to configure DHCP reservation, click here. The Linksys Smart Wi-Fi provides best viewing experience for devices connected to your network such as smartphones, tablets, gaming consoles, cameras, and wireless printers a lot. Check out the link below to learn how to view the list of devices in your home network.